Once contemptuously described in a BBC news report as a ‘bizarre freak’, David Bowie emerges from this exhibition as one of the most influential individuals in western culture of the past fifty years. 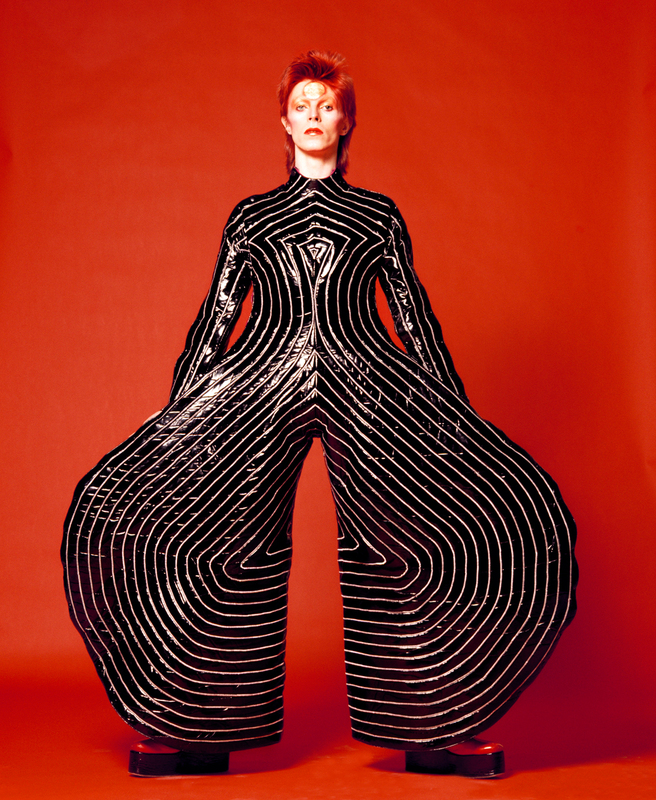 Using material borrowed from his personal collection, the curators have constructed a show illustrating Bowie’s dynamic self-invention and his restless curiosity about the world around him. Drawing on a huge range of sources ranging from Weimar cabaret, Stanley Kubrick, J.G.Ballard, Little Richard and Andy Warhol among many others, Bowie is the ultimate assimilator of style and ideas. Paul Robertson’s ‘Periodic Table of David Bowie’ here demonstrates the disparate lustre of Duchamp and Dietrich in Bowie’s world. The exhibition demonstrates how he has found an identity free from expectation or restraint. What’s radical about the exhibition is it’s assertive eclecticism. We see a tiny model of Queen Elizabeth’s coronation coach alongside ration books articulating Bowie’s suburban childhood. A huge selection of costumes, album covers, handwritten lyrics, videos and ephemera like a lipstick imprint on a tissue weave together Bowie’s achievement. Hybridity is his enduring passion collecting, quoting and sampling the cultural world around him in support of a determined vision. He ransacks and mashes together the bric-a-brac of human life: history, science fiction, art, film, theatre and fashion. All these inconclusive traces of the man born as ‘David Jones’ confirm that he is an elusive performer of fictions. The Victoria and Albert Museum is pioneering a new exhibition model here. Objects are piled high and compete for attention. Order is discouraged and sensory overload prevails. Peepholes illustrate models of a painter’s studio stacked above a Buddhist prayer hall alluding to Bowie’s early professional confusion, which he resolved by feeding it back into his work. The audience must navigate clashing disguises and theatrical props. Sound is appropriately important to the design and each visitor listens to an ‘audio-guide’ playing songs and commentary triggered by your movement on the exhibition floor. In a thrilling simulation of a concert, visitors watch Bowie as Ziggy Stardust and Aladdin Sane’s appear on giant screens rising 20 metres high in which costumes are embedded on illuminated shelves.